Excellent drinks, classic food and a 60's vibe are what make West 5 a Westside favorite. Dean Overton knows all about positive vibe. After a longtime career in the record industry, he created this cool and laid-back quintessential lounge on California known as West 5. It’s a landmark, iconic lounge with a huge departure from its previous purpose as a shooting range and bowling alley years past. Dean partnered with lifelong friend, Dave Mountoure, who left a jet set tech job to transform the space with neon, ultra comfortable furniture and relics from past West Seattle drinking establishments. Why celebrate West 5 today? After fifteen years they’re still going strong. Their original vision can be felt and seen throughout from employees who quickly become family to supercool, vintage décor. Happy, longtime loyal employees work alongside Dean and Dave at what they all call their “second home”. 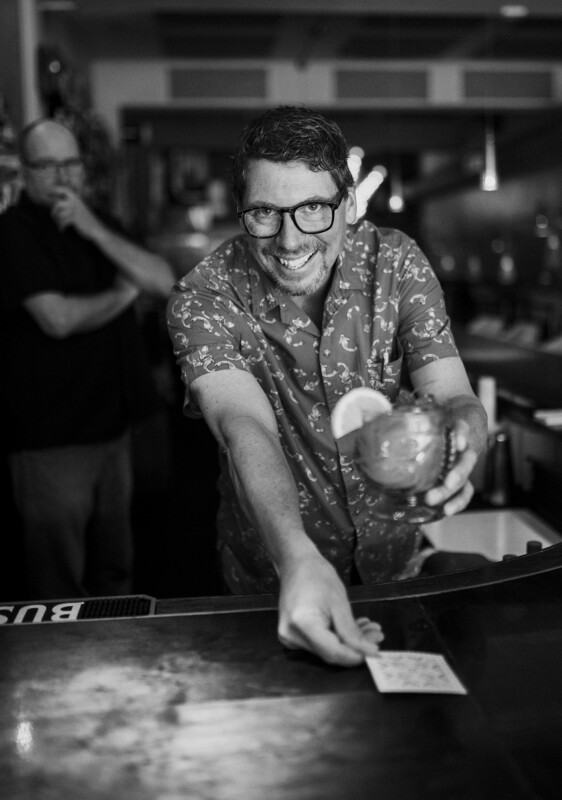 With a personality of it’s own, an iconic fixture of West Seattle ever since 2003, one can surmise it’s the people who make the place. The staff is genuinely kind they care about one another and their customers. There’s no doubt you will be welcomed into this warm environment with Dean and Dave and their well-appointed employees taking care of you. Case in point, a previous employee swung by to say hello to Dean. He left West 5 a year prior to pursue an art career. “I want the best for our employees even when they move onto another job. Their happiness is important to me,” said Dean. If this feel-good stuff isn’t enough to draw you in, The Duwamish Mafia, a swirl of Woodinville Rye Whiskey, Averna Amaro and a dash of Angostura Bitters is described as giving “euphoric reverence”. This curious and tantalizing drink is just the beginning of what West 5 offers. They’re dedicated to making sure it’s the place where guests are allowed to truly relax. Meaning, this is a place for everyone to live and lounge amongst friends, neighbors and visitors to our community. Cheers to Dean and Dave for creating a vision that keeps on thriving. © 2017 Robinson Communications Inc. All Rights Reserved.